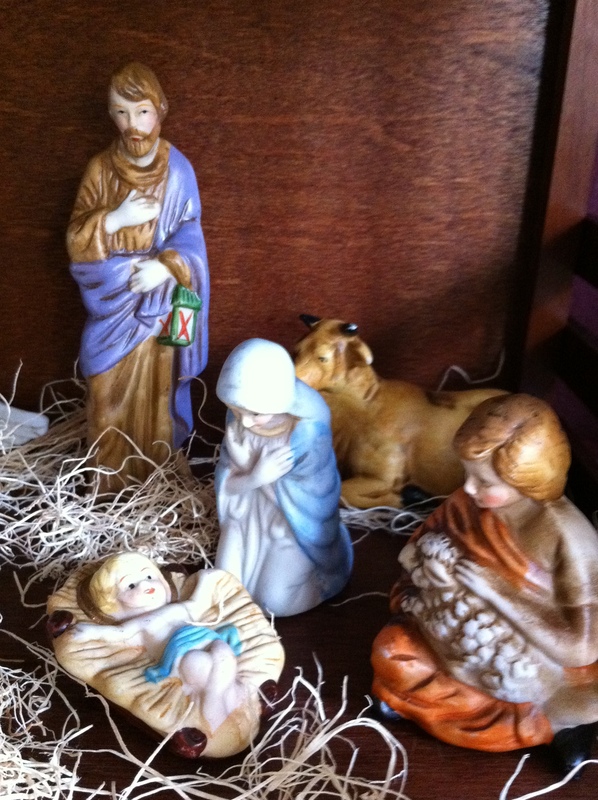 Last week I unpacked my grandmother’s nativity set and assembled the scene of Mary and Joseph, baby Jesus, shepherds, wise men, and sundry animals on a shelf in the living room. 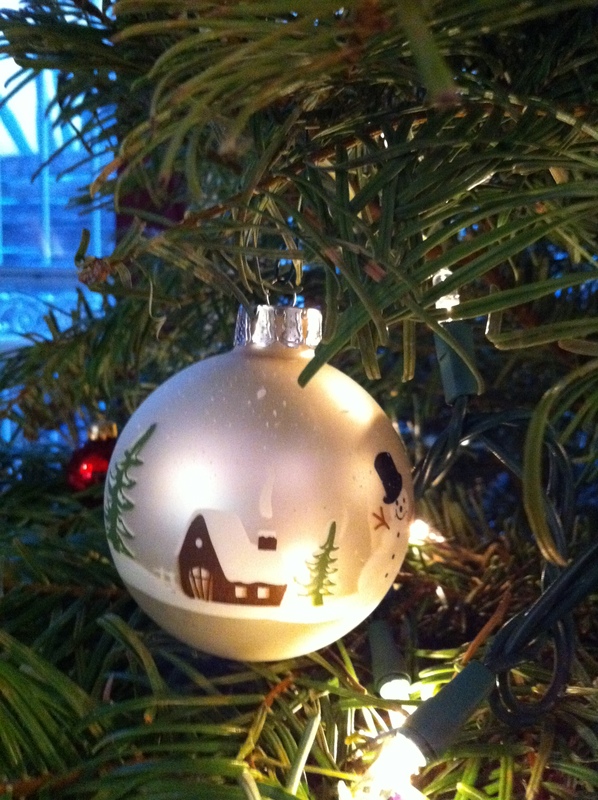 As I scattered straw through the stable and watched the cats chase each other around the trunk of the Christmas tree, I enjoyed a glass of Chianti—the Carlo Rossi kind out of the large, screw-top jug. 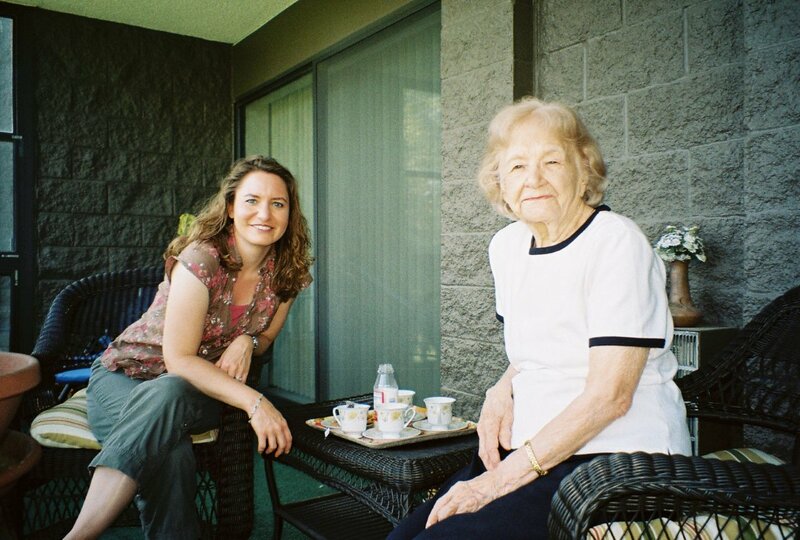 My grandmother loved her Chianti, and when it turns five o’clock in Heaven, I know she is sitting up there, glass in hand, enjoying the slightly dry vintage along with a plate of kielbasa or sauerkraut pierogi. This week last year I drove to Denver to spend the day with my Grandmother Lillian. I hadn’t seen her in over a month, and I was looking forward to our usual outing: meatballs and salad at a nearby Italian restaurant (washed down with glasses of Chianti, of course), followed by a shopping trip to Kohls. My uncle had phoned a day earlier to tell me he received a message from a security guard at her retirement community. On the way to Mass, she had rammed her car over a curb and into street sign. She seemed confused and in poor health. I promised to check up on her. When she answered my knock, I caught my breath and braced myself against a sinking feeling in the pit of my stomach. I had always described my grandmother as an older, more sophisticated version of Audrey Hepburn in Funny Face. She often paired a black turtleneck with black wool pants and ballet-style loafers, which accentuated a blond bob and carefully applied lipstick. But on that day, a large bruise covered her face where her head had hit the steering wheel. She hadn’t changed her clothes or done her hair in several days. From the state of her apartment, I could tell she hadn’t been eating or drinking either. That day began a stressful, two-month journey to the end, a journey that included various hospitals and skilled nursing facilities. When it became clear that Grandma Lil would never leave the nursing facility, my uncle spent Christmas Day going through her things, packing most of them up for donation. My sister and I stopped by to take those items special to us—a box photographs from the 30s and 40s, a rosary made of glass beads, a fur coat, paintings of flower and birds, and a candy dish remembered from childhood holidays. The frustration of sorting through packed closets and cupboards competed with a deep sadness over a beautiful life coming to a close—a life represented by so many material possessions that evoked treasured memories. I struggled with the guilty knowledge that my grandmother didn’t know what we were doing with her beloved apartment. Until the end, she remained convinced that she would eventually return home. 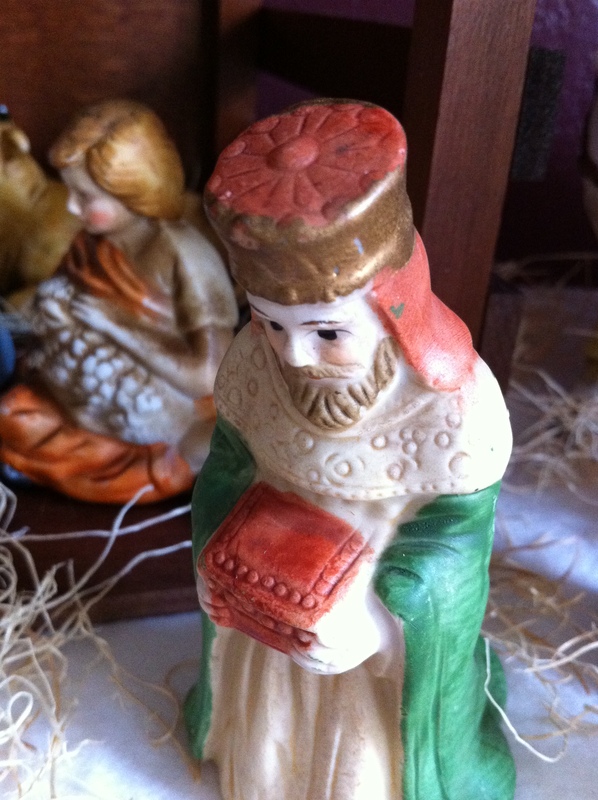 As we emptied the apartment, I searched every closet and cupboard for the one thing I really wanted—my grandmother’s nativity set. After the last piece of furniture had been hauled away, my uncle phoned to say he had found it—one of the last boxes in a storage room in the basement. My grandmother passed away on March 6th of this year. We will miss her as we sit around the table on Christmas afternoon, aware of her absence. The daughter of Polish immigrants, she possessed an elegance, generosity, and innate sense of hospitality that led her to share whatever she had with those around her. To her, that was the American dream: she acquired beautiful things in order to share them with others, and she expressed love through an abundance of food. I will always remember her breaking into a giggle, her eyes lighting up with delight, as her grandchildren arrived at the old farmhouse for a holiday. Sometimes I can still hear the faint echo of that laugh. Unlike my grandmother, I don’t like Christmas. There, I said it. I want to like Christmas. I want to bask in the glittering decorations and lights, in the sound of bells and carols. I want to enjoy the delicious treats made only at Christmastime and the decadence of shop-till-you-drop. I want to relax with family and friends in front of the fireplace, mug of hot cocoa in hand, while large snowflakes fall outside. Instead, around the middle of December, I descend into a frenzy of decorating, cleaning, baking, shopping, and wrapping. As I run around trying to get everything done on time, I find roads jammed with people heading for the shops, no parking spaces at the mall, and the pre-set holiday budget going out the window. 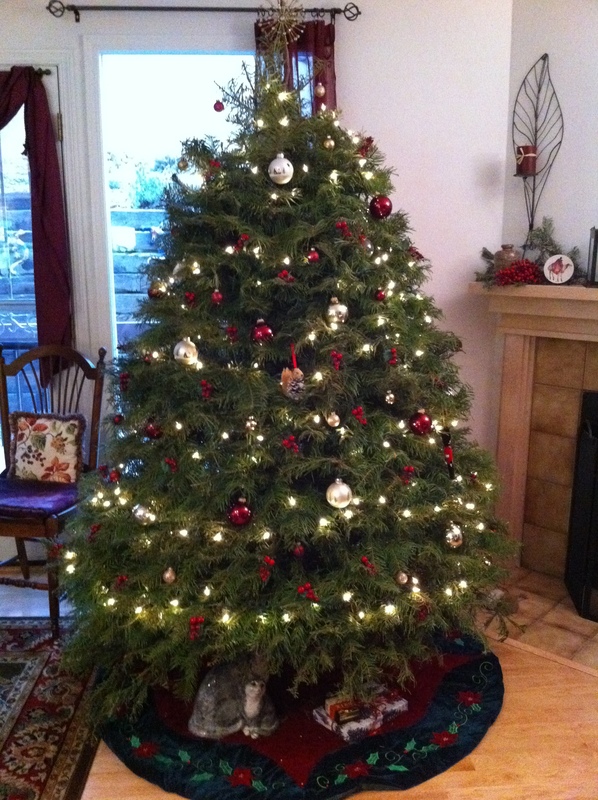 There are Christmas parties and concerts that must fit somewhere between writing Christmas cards and vacuuming up the pine needles that fall to the floor whenever the cats scale the tree. Since both my parents and in-laws live only an hour away, the Philosopher and I find ourselves negotiating the demands and expectations of both families. Mid-December also marks the end of the fall semester for both of us, which means grading stacks of exams and papers and submitting volumes of paperwork to the university. Add to this our anniversary, the annual visit of close friends over New Year’s and The Philosopher’s birthday, all of which take place before January 7th, and you have a recipe for high-stress and possible financial disaster. The ancient Celts believed in “thin places.” These are sites where the divide between this world and the next is “thin,” where a person feels more strongly the presence of God, or a mystical connection to those saints who have gone before. One example is the town of Kildare, Ireland, the site where Saint Brigid, a contemporary of St. Patrick, built a religious community and where the thirteenth-century Kildare Cathedral now stands. Legends of Saint Brigid have blended with those of an earlier Brigid, a holy woman of pre-Christian times, and today pilgrims visit St. Brigid’s Holy Well for contemplation and healing. But I have always thought that there are also “thin times,” those times of year when we feel a closer connection to those we have lost, when something inside of us longs for reflection, for things beyond the present, for mysterious things we cannot see. I believe Christmas is one such “thin time,” which our ancestors intuited as they chose to establish the celebration of Christ’s birth at the time of the Winter Solstice. Sometimes I think that the endless shopping, spending, decorating, eating, and rushing around is our way of dealing with a “thin time,” of blocking it out, of refusing to let it touch us on a deep, even dark level. Each year I find myself bristling at the frenzy, longing to sink into the thin time by distancing myself from the people and noise surrounding the season. The Philosopher tells me this is unduly pessimistic. He prefers to see the communal celebration of Christ’s birth as our way of bringing joy to the darkest time of the year. It is letting the light of Christ into the dark spaces of our lives. Each year I attempt to simplify Christmas. Since going gluten-free and discovering my low tolerance for sugar, I have stopped baking for the holidays. Although I am learning to work with gluten-free flours, I don’t always succeed in my efforts, and I find I can do without tins of Christmas cookies and fudge. These days, I opt to bring a salad to potlucks and holiday parties. As many buffet tables are piled high gluten-filled sweets and casseroles, hostesses and guests appreciate a fresh, elegant salad. 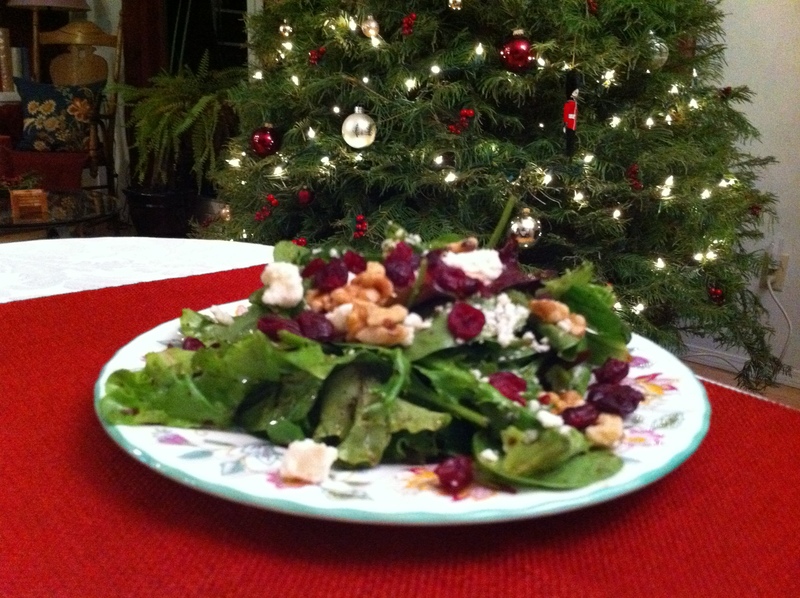 This year, my favorite salad includes baby field greens, dried cranberries, crumbled feta, and walnuts. The salad looks pretty and festive, and it gets me out of the rut of thinking of salad as merely romaine and tomatoes. With the dried cranberries and a dressing made of honey and balsamic vinegar, this salad is just sweet enough that you might not find yourself tempted by those trays of Christmas cookies. Better yet, the salad takes a grand total of five minutes to assemble, including the dressing. 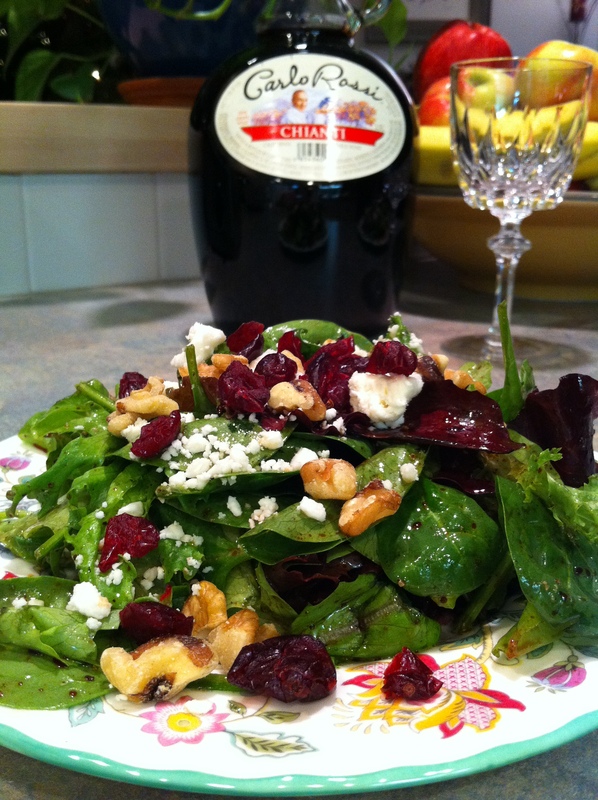 If you are still devising your menu for Christmas day, this salad makes a lovely first course. As I admire my grandmother’s nativity set on the shelf, I am trying to adopt The Philosopher’s view of the “thin time.” It helps to have a glass of Chianti nearby. Assemble salad ingredients in a large bowl. Blend together dressing ingredients. Pour dressing slowly onto salad, mixing frequently, just until salad greens are lightly coated. If you are bringing the salad to a party, take the dressing in a separate container and apply it when you arrive to avoid soggy greens. Variation: Add strips of grilled chicken breast to turn this salad into a light lunch or supper. Half-way through my container of General Tso’s chicken, I looked up to find him watching me. As I complete the final revisions to my novel Shadows at Moose’s Run, I am realizing how much my heroine eats. Before returning to her childhood home in the Colorado mountains, Maddie spends her final night in New York gorging on platters of lasagna with her best friends. On her thirtieth birthday, her father presents her with a luscious chocolate cake. She attempts (unsuccessfully) to win the heart of a childhood friend with her chicken cacciatore, and she devours an entire package of Oreos after breaking up with a new love. All of this on top of plates of pierogi made by her Polish grandmother—a cure-all for the brokenhearted. Oh—and Maddie also drinks wine. Lots of wine. And because I write fiction, Maddie never counts a calorie, or steps on a scale, or refuses that last slice of pizza. Lately I have stumbled across several novels within the genres of women’s fiction and chick-lit that depict heroines obsessing about their weight and their relationship with food. Will Anna lose enough weight to fit into that little black dress, the one with which she hopes to seduce a positively devilish hero? Will Lucy realize that the town heartthrob really does love her, despite her full figure? And then there is the iconic Bridget Jones, who records her daily consumption of vices such as wine and “ciggies” in her diary. I understand an author’s wish to tap into the real-life issues that concern female readers, but a heroine’s waistline just doesn’t interest me. While I enjoy fiction that tackles difficult issues, there are some things I want a novel to transcend, and a heroine’s calorie count is one of them. Laura Esquivel sets her quirky novel Like Water for Chocolate (1989) in rural Mexico at the turn of the twentieth century. As the youngest daughter, Tita is expected to remain single and spend her life caring for her aging mother. When Tita falls in love with Pedro and her mother insists that the unlucky suitor marry Tita’s sister, Tita takes her revenge—in the kitchen. Each chapter of this lovely novel begins with a recipe, as cooking becomes Tita’s link to tradition, as well as her salvation. In Sarah Strohmeyer’s Sweet Love (2009), forty-something, single mom Julie signs up for a course in desserts, offered by a renowned French chef at a local cooking school. She never expects to meet fellow student Michael, who happens to be the first love she rejected years earlier, now freshly divorced. Over sugar, chocolate, and mishaps in the kitchen, Julie and Michael deal with the misunderstanding that tore them apart years earlier. And now . . . thinking of food, and heroines who eat . . . a recipe. 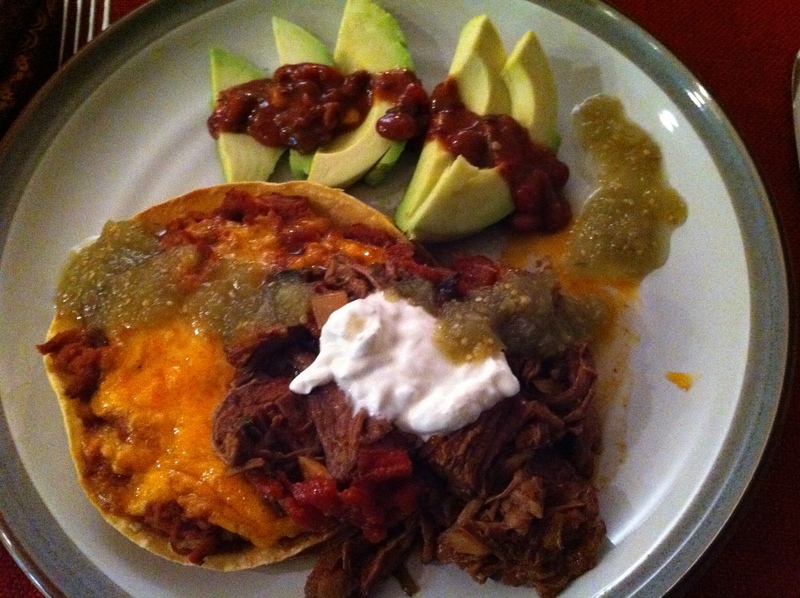 This week, I gave in to the craving for TexMex and made a crock pot full of shredded beef, which I used for tostadas. The dish is healthy and relatively inexpensive to make, yet caloric enough even for my heroine Maddie. I must give credit to my friend and artist extraordinaire Elizabeth Diaz, who thought up a basic recipe for pulled pork. After experimenting with a variety of ingredients, I settled on the final recipe below. Since The Philosopher doesn’t eat pork, I normally use beef instead, which seems to work just as well. Combine the first twelve ingredients in a crock pot. Cook on low for eight hours. At the end of the cooking time, shred the meat with two forks and mix thoroughly with the sauce. Place corn tortillas directly on rack of oven for 2-3 minutes to warm. Line baking sheet with aluminum foil (this cuts down on cleaning time). Place corn tortillas on baking sheet and top each with a layer of refried beans and cheese. Bake the tortillas until cheese is melted and beans are warm (10 minutes). 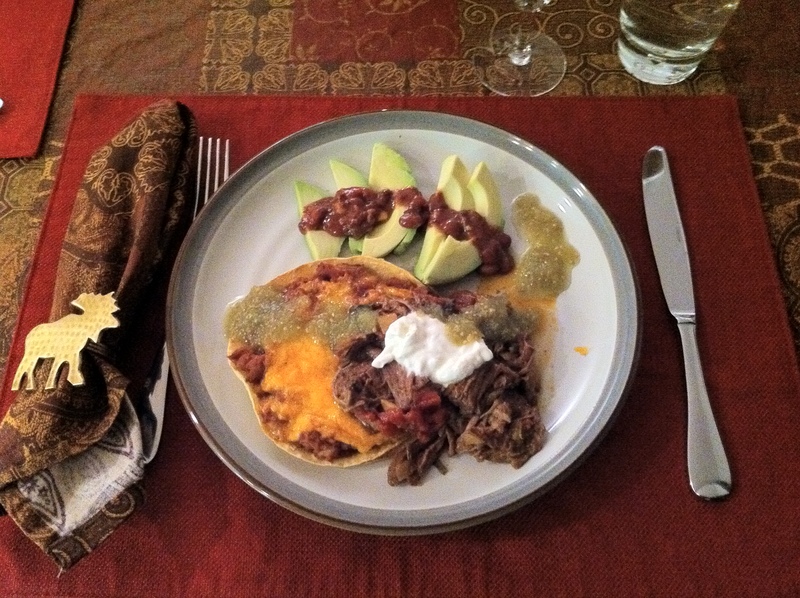 Top each tortilla with pulled pork mixture. Finish off the plate with desired toppings. My friend Elizabeth browns her meat in olive oil before putting it in the crockpot. I’m too lazy to do this—and I think it defeats the purpose of a crock pot. However, browning does bring out the flavors of the meat. If using pork, be sure to buy a tenderloin. The Mother-in-Law tried this recipe using pork roast. The meat would not shred. I tend not to measure my spices. The quantities listed above are approximate values and merely a starting point. You can increase amounts if you prefer more spice. If you are concerned about gluten, be sure to check labels to make sure you are buying gluten-free. You’d be surprised what some manufacturers will add to broth, sour cream, and canned veggies. If you are not concerned about gluten, try the following: roll up the pork mixture in several large flour tortillas and place them in a baking dish. Top with a jar of good quality salsa verde and the cheese of your choice. Bake at 400 degrees until cheese is melted and bubbly. Let me know how this recipe works for you, or if you have suggestions for variations. Also, I’d be interested in your recommendations for novels in which food or cooking becomes a central plot point and a metaphor for a heroine’s personal growth.